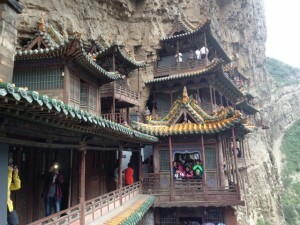 UPDATED: I was able to upload the video from the Hanging Monastery. Take a look below! 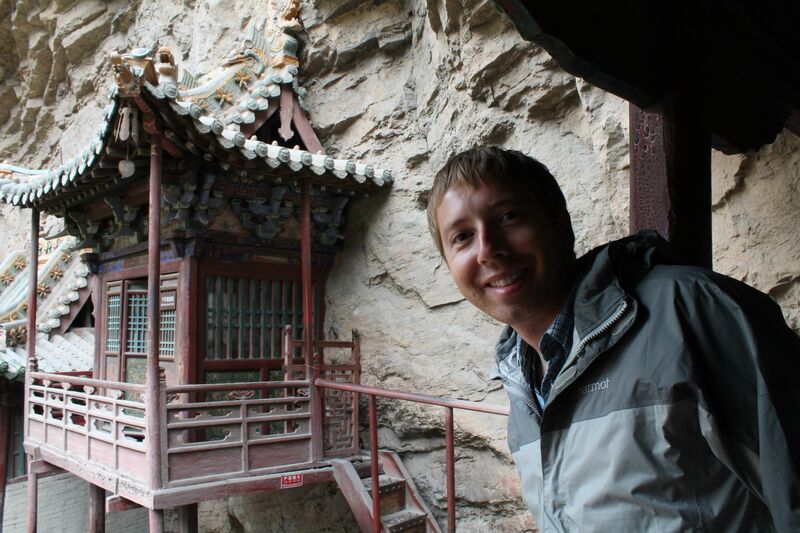 As Shelley pointed out in a previous post, Datong was a pretty fascinating place. 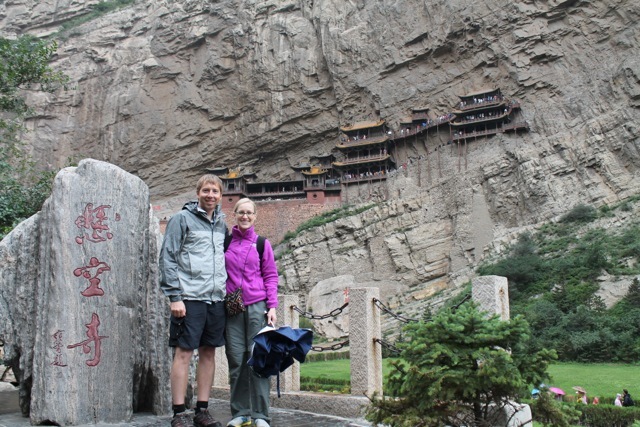 In addition to experiencing “Real China,” we also had the opportunity to see some really incredible sights while we were there. 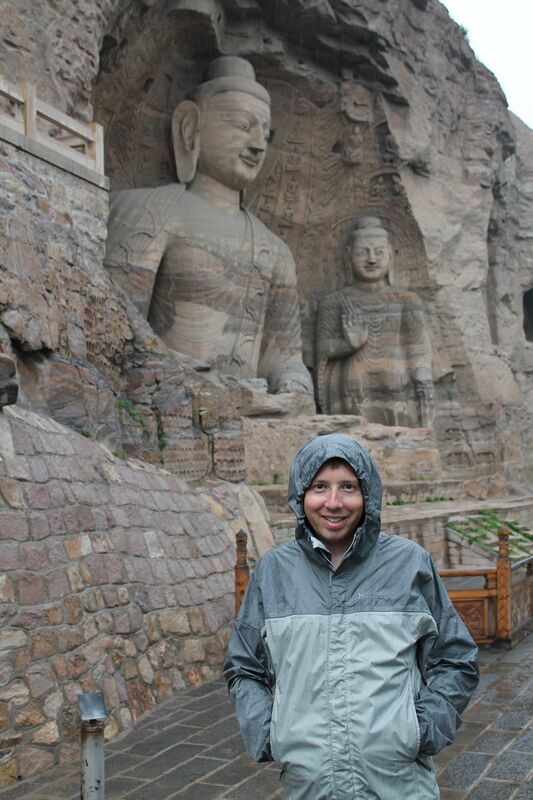 About 40 miles outside of the city of Datong, on the face of Mt. Hengshan, hangs Xuan Kong Si. This Hanging Monastery was built in the year 491, and clings to the face of the mountain 246 feet above the ground. It does so via a network of timber structures that are deeply embedded into the rock. Today, architects still marvel at its construction. As you can see from the picture above, it was a windy, rainy day when we visited the monastery. However, due to its position on the face of the mountain, it’s well shielded from the elements – another reason it still stands. So, while we were in the monastery proper, we were well protected from the wind and rain. All that being said, it’s still a precarious tour. 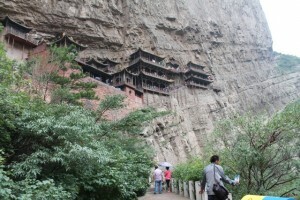 It’s hard to capture in pictures, but the monastery tour is a bit scary for your typical, 2012-sized person. This place was built for tiny people! You duck under every door, and the wooden and stone railings – the only things keeping you from plunging 246 feet to your death – are only about 3 feet tall. So, as you walk up and down the stairs of this thing, you’re being very careful to watch your step! 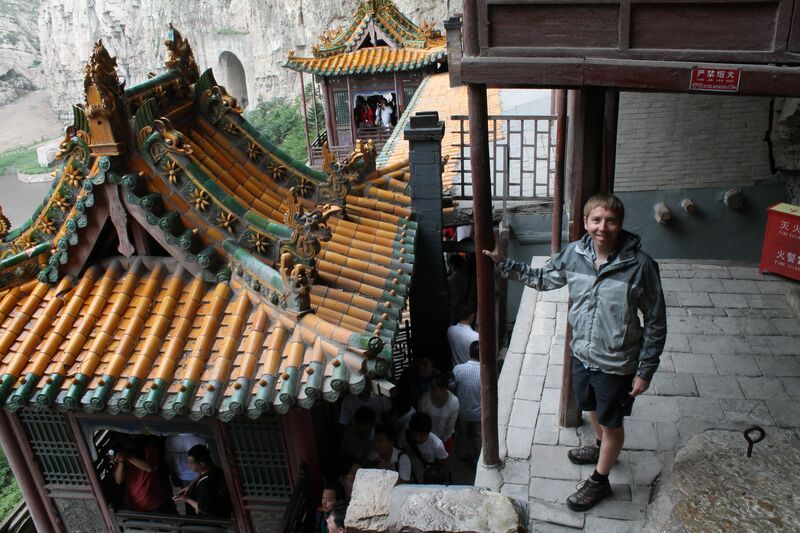 Here’s a cross shot to give you some perspective of what it was like walking through the Hanging Monastery. UPDATE: Here is the video that I was unable to upload before. Enjoy! Again, those are the only railings protecting you from falling to your death. Can you imagine this kind of tour in the US? Oh, the waivers you would sign!On the way to the top, you could physically touch some of the wooden supports that still hold this thing up, some of which you could see shake due to the weight of the people on the levels above. The guy right behind me on the way up grabbed onto one of the supports and shook it just to see how loose it really was. Um, not cool, buddy. After our tour of the Hanging Monastery, we continued our Indiana Jones-like day with a tour of the Yungang Grottoes. 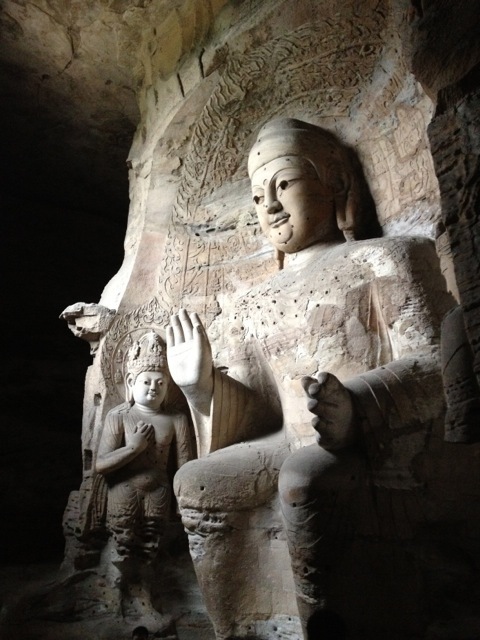 Carved in the 5th century, these Buddhist caves were straight out of “The Last Crusade.” 53 caves of varying size make up the grottoes, and they contain over 51,000 individually carved statues. 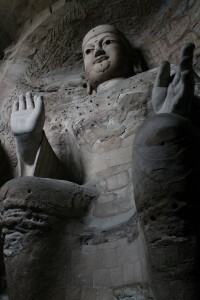 The statues in the photos below were some of the largest, about 3 stories tall. 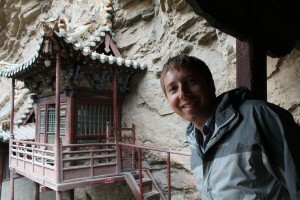 The location of the grottoes isn’t so great – right next to the Datong strip coal mine. So, many of the carvings were covered with coal dust. The Chinese obviously have a different perspective on antiquity to build a mine so close to these relics. However, before the influx of potential tourists that were accompanying the 2008 Olympic games, the Chinese sought to actively protect this site. Much like they’ve been modifying the city itself, they’ve built brand new, old-looking, touristy temples by the entrance and have planted many trees to act as a barrier to the coal dust. It was another strange mix of old and new. I love you guys, and I love your blog. It is such a treat to experience all of this through your eyes, and it is fun to feel connected even though you are so far away. Keep all of the great photos, stories, and insights coming, and stay safe! So lovely! Great blog and love that you love to travel. Must be in the genes!